With so many different interpretations, which run the gamut from spot-on to the exceedingly problematic, it might seem like an inescapable cul-de-sac to look to their works for elucidating power dynamics in the world today. Their capture by the academy, that assembly-line of homogeneous thought, only compounds this weariness. 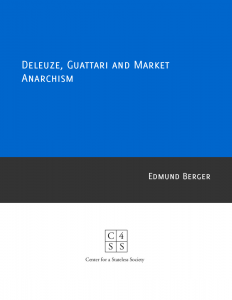 It is my contention, nonetheless, that Deleuze and Guattari (henceforth D & G) has much to offer us today, and constitute a radical break (or, in their lingo, a schiz) is the annals of leftist theory that points the way towards a vision of the future that is similar to what Benjamin Tucker described as “anarchistic socialist” – or, in the parlance of today, left-wing market anarchism. The charge of accelerationism is one that should not be warded off, but embraced, but only with a delicate unpacking. Light readings, lacking in nuance, have attached D & G’s reflections as one-off musing at best, and at worst, an uncritical acceptance of the then-emergent neoliberal capitalism, with its rhetoric of global markets, deregulation, and openness. The identification of accelerationism with the latter should be avoided (as well as the more recent association of accelerationism with state-centric technological development); instead, lets look to the possibility of an accelerationism that is ‘anarchistic-socialistic’ in nature, utilizes markets, and operates in unbridled antagonism to the conditions of the present. To do so, tracing out the positioning of markets against capitalism in D & G’s work should be carried out. What follows a cursory exploration of this, though it is by no means an exhaustive treatment. But first, we must look to D & G’s own stance towards the political itself, as individuals and together. II. Marxists, Anarchists, Both, or Neither? Providing a precise set of political coordinates for D & G’s theories, other than a very far-left orientation, is itself a rather difficult task. Like Foucault, Baudrillard, and others lumped together under the problematic sign of ‘post-structuralism’, D & G are often invoked by anarchists, particularly those in insurrectionist, communization, and and post-left currents, but debate over their status as anarchists has persisted over the years. It is not, of course, relation to the history of ideas or the name-drops one makes that dictates proximity to anarchism. Aside from tangential relationships with anarchist and quasi-anarchist groups (Guattari through the Autonomists, Deleuze through the Prisoner Information Group, an anti-prison activist network set up by Foucault), it is clear that the philosophy suggested by D & G is teeming with positions and propositions well familiar to anarchists. Among other things the two reject the state, capitalism, the USSR, fascism, the police, democracy, racism, colonialism, taxes, and even nostalgia, managerialism, and fixed identities. To what extent can D & G be considered Marxists? It is undeniable that Marx holds an important position in their work – particularly in Anti-Oedipus, which sets its revolutionary praxis up as a combination of Nietzsche and Marx. Two decades prior to his collaboration with Deleuze, Guattari could be found in the thick of the two major intellectual tendencies of post-war France: existentialism and Marxist communism. In the late 1940s he was a prominent figure in the French section of the Fourth International of the International Communist Party, itself a band of militant Trotskyites; throughout the 1950s, he would drift towards a more libertarian communist position, working with other radicals and writing detailed critiques of the Soviet Union’s state structure and organizing against the Stalinists in the mainstream of French communist politics. In 1964, when this left opposition began to identify as Maoist, Guattari broke with them and began to move in the direction of the anarchic sectors of the students movement. As far back as the Communist Manifesto, Marx draws our attention, usually through the use of ecstatic and poet imagery, to the positive aspects of capitalism in that it both destabilizes old formers of power while simultaneously carrying out processes of ‘modernization’. “All fixed, fast-frozen relations”, as the famous passage goes, “with their train of ancient and venerable prejudices and opinions, are swept away, all newly-formed ones become antiquated before they ossify. All that is solid melts into air, all that is holy is profaned, and man is at last compelled to face with sober senses his real conditions of his life, and his relations with his kind.” It is for this reason that D & G use terms like line of flight, deterritorialization, and decoding to describe capitalist relations: “lines of flight” because it follows a snaking trajectory of desire towards the new; “deterritorialization” because it uproots things from where they are stuck and allows them to circulate; and “decoding” because it breaks down codes, that is, the strictures of tradition, identity, culture, and other imposed value systems. D & G offer an escape from these inconsistencies and ambiguities, but it is an escape route that changes the very nature of the Marxist analysis of capitalism, and with it, the revolutionary goals that this analysis is intended to point towards. What is essential to note is that the elements that are identified as being ‘positive’ in capitalism – lines of flight, deterritorialization, decoding – are also the very things that become associated with liberatory politics. To wage a non-fascist revolt against the world – which is indeed the very goal of a book like Anti-Oedipus – is to revolt against the old in order to break open the possibility for new forms to arise. For Deleuze and Guattari it is desire itself that motors this process, just as it is desire that motivates all attempts at to move along a line of flight, to deterritorialize, and decode. Similarly, forces like deterritorialization and decoding put into play new desires that were not previously there. Deleuze and Guattari’s conception of desire is productive and tends towards excess and circulation, as opposed to the notions of desire rooted lack (as offered in earlier psychoanalytic discourses of Sigmund Freud and Jacques Lacan). That capitalism requires a state to maintain itself is no new revelation (nor is anything in the paragraph above). The best of Marx’s writings laid out, in incredible detail, the way the evolution of the modern state played a fundamental role in the birth of capitalism, while Benjamin Tucker’s excellent analysis showed how state action built up capitalism, as opposed to deterring it. The post-Marxist Regulation of School, which includes figures like Michel Aglietta and Bob Jessop, has conducted numerous studies of the way regulatory systems allow capitalism to ‘reproduce’ its relations. What D & G are describing here dovetails with these various analyses, but they are concerned with a very specific function: the way the state ‘seizes’ or ‘captures’ increasingly larger and larger elements in the forces that are being unleashed as a means of maintaining the entities that profit from this unleashing. While this might sound somewhat esoteric (and counterintuitive, especially in the face of traditional economic discourses), this process is more or less a depiction of networks of power relations being ‘reproduced’ by the constant co-production of capitalism and the state. In A Thousand Plateaus, these dynamics get recast as a struggle between state apparatuses and war machines. In Anti-Oedipus, divergent, deterritorialized and decoded flows and forces are treated as having “nomadic” qualities; the “war machine” is the next stage of this analysis, focusing on the more intransigent and conflict-driven aspects of their functions. War machines, in other words, make exactly what their name implies, and the target of this war is the state itself (D & G here were drawing on the anthropological work of Pierre Clastres, which analyzed the way certain indigenous societies made the repelling of the state the very rationale of their social quasi-orders). War machines come in many different forms: your affinity group is a war machine, the agorist is a war machine, street gangs and pirates, even certain kinds of commercial organizations. Not all war machines are positive: they’re capable of being darkly violent, tribalistic, even fascistic. While much could be said about this, it is the specific confluence of the war machine with particular economic functions that concerns us here. Of taxation we’ve already said quite a bit, so it is rent and profit that must be addressed. While taxation is obviously correlated to state function, for many the suggestion that rent and profit – two fundamental aspects of the capitalist market economy – arise from the functions of the state might appear as absolutely erroneous. But consider the little-acknowledged understanding, even in conventional economic discourses, that the more open the systems of exchange and circulation are, the more the capacity to maintain rates of profit accumulation in the long-term falls. With the capacity to enter freely, or to subtract entire sets of relations, from market systems, the ability for certain actors to assume an inordinate share of the market becomes untenable – which is precisely why reliance on state-granted and enforced monopolies becomes necessary for entrenched power structures to shore themselves up against this deterritorializing tide. A more contemporary example of these dynamics in action would be the way 1) tinkerers and hackers produced paradigm-shifting innovations in information-communication technology; 2) the subsequent capture of these innovations under the state’s enforcement of IP laws and their service to large, top-heavy multinational corporations; and 3) the way further innovations from these developments are obstructed. Thus we can suggest a direct continuity between the reflections on artisans, craftsmen and metallurgists in A Thousand Plateaus to the musings on piracy and hacking in “Postscript on the Societies of Control” alluded to earlier. [W]hich is the revolutionary path? Is there one? – to withdraw from the world market, as Samir Amin advises Third World countries to do, in a curious revival of the fascist “economic solution”? Or might it be to go in the opposite direction? To go further still, that is, in the movement of the market, of decoding and deterritorialization? For perhaps the flows are not yet deterritorialized enough, not decoded enough, from the viewpoint of a theory and a practice of a highly schizophrenic character. Not to withdraw from the process, but to go further, to “accelerate the process”, as Nietzsche put it: in this matter, the truth is that we haven’t seen anything yet. Is this not a vision of militant, leftist (or even post-leftist) articulation of how systems of exchange and circulation, operating on a global level, can undermine dominant ecologies of power, and that crude brutalism they inexorably tend towards – fascism? It is not a secret ode to neoliberal globalization, or the breakthrough of the capitalist world market; following their vision of the state and capitalism as forces bound up together as a common, modular, and reactive assemblage, ‘neoliberalization’ and all that comes with it (the slippering sloganeering of ‘privatization’, ‘deregulation’, ‘austerity’, ‘structural adjustment’, etc.) is nothing more than the next unfolding of the processes of adding and subtracting axioms. A positive left-wing anarchist accelerationism would have to position the horizon of their political activity beyond axiomatics, in a future space that breaks apart these ecologies. This is a future where desire operates at the “molecular” level, not at the level of some abstract collectivity. ixSee the correspondence between Marx and Vera Zasuluchi that occurred in 1881: https://www.marxists.org/archive/marx/works/1881/zasulich/index.htm. A concern of this correspondence was the conversations between revolutionary Marxists in Russia about whether or not capitalism – and the sorts of large-scale modernizing processes that industrial capitalism brought with it – was necessary for the establishing communism.